Chocolaterie Robert has a history of chocolate production dating back to 1937, when a French couple from Réunion Island, Mr and Mrs Robert, set up Madagascar's first chocolate factory in Brickaville, where pralines and chocolate bars were handmade. At the time of the rule of the last Queen of Madagascar, the area around Brickaville was where cacao plantations were first introduced to Madagascar. Following the French colonisation, cocoa production eventually moved to the Ambanja region which became the preferred location amongst French settlers keen to supply a metropolitan France with agricultural products. In 1958, the factory changed hands to the Berger family and moved to its current location in Antananarivo. In 1977 the company was sold to the Ramanandraibe Group. 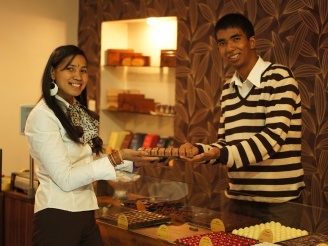 In 1999 the first two La Chocolatière boutiques were launched in Antananarivo. In 2004 two more boutiques opened in Antsirabe and Tamatave. In 2008 a La Chocolatière boutique was opened in the departure area of the duty free zone at Ivato International Airport. In 2011 a small and elegant La Chocolatière boutique opened in the the upmarket shopping and hotel district of Antaninarenina, next to Tana Hotel and within a short walking distance of Hotel Colbert and Le Louvre Hotel. In 2006 Chocolaterie Robert began shipping Mora Mora and Sambirano branded chocolates to Britain, which respectively won the Chocolate Academy's Silver Cup and the Best Buy Ethical Award. However, these two brands are no longer distributed. Since 2009, a range of chocolate bars branded VAO VAO are being exported to the United States through partner distributors. 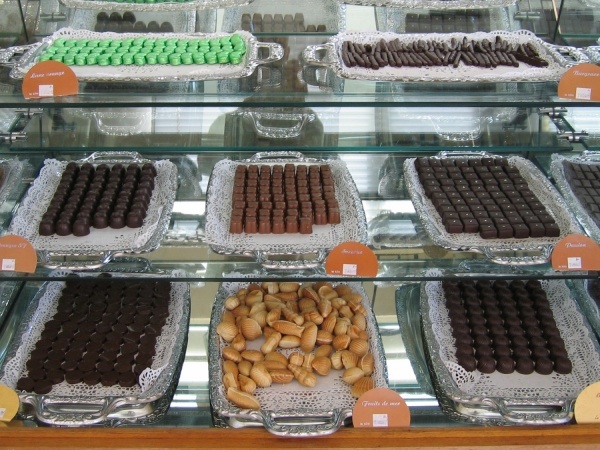 A selection of fine pralines sold at one of Chocolaterie Robert's boutiques, La Chocolatière, Antananarivo. Chocolaterie Robert is a household brand name in Madagascar where its chocolate bars can be found everywhere from small village shops and department stores to upmarket confectionery stores and gift shops in cosmopolitan areas. In rural areas, usually one or more of Robert's chocolate bar varieties can be found. Chocolaterie Robert's dark chocolate launched in 2010: The blue packaged bar with 61% cocoa, kaffir lime and Fleur de Sel (top layer of hand harvested sea salt) and the red packaged bar with 68% cocoa and fragmented nibs (splinters of cocoa). The Malagasy cocoa, also known as “green gold” of Sambirano, has in recent years gained reputation for its superior quality amongst chocolate experts worldwide. However, Malagasy cocoa production remains relatively small-scale in comparison to other major cocoa exporting nations. Chocolaterie Robert's classic range of bars include Blanc Superérieur (34% cocoa butter), Noir Spécial (73% cocoa), Supérieur au Lait (34% cocoa) and Noir Supérieur (47% cocoa). Chocolaterie Robert is a major contributor to the local economy, providing employment for about 120 independent farmers and up to 200 factory workers. The company operates both as a cacao bean processor and chocolate manufacturer, using 500 tons of the total 4,000 to 5,000 tons annual cocoa production in Madagascar. To ensure premium quality cocoa, the Ramanandraibe Group has set up 23 support centres throughout the Sambirano Valley providing technical assistance to farmers. Fermentation tubs and drying areas for cacao beans are subsidised by the group. Madagascar cacao farming typically resides in the hands of small family businesses of farmers who live by their land and tradition while passing their skills onto future generations. A 13-minute video documenting Chocolaterie Robert's bean-to-bar chocolate production, as displayed at the La Chocolatière boutique in the departure lounge at Antananarivo airport. In French language. In recent years, Chocolaterie Robert has combined its time-proven knowledge of chocolate production with the expertise of renowned French Chocolatier André Rosset who has advised the company in the latest trends and technologies in the fine art of chocolate making. 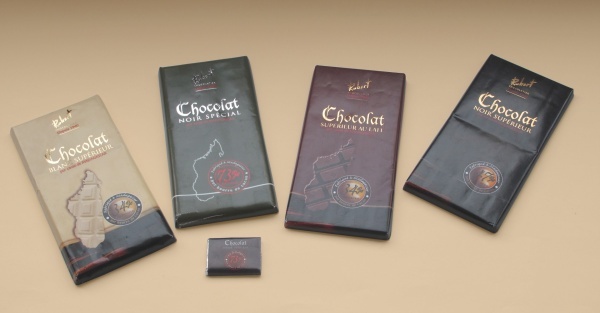 All of Chocolaterie Robert's products are classified as pure and single origin entirely made in Madagascar. 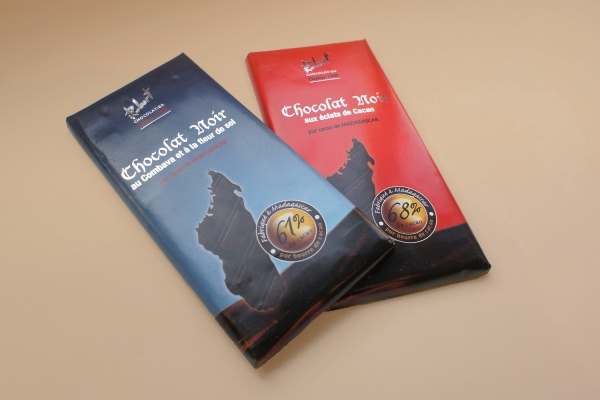 Dark chocolate made by Chocolaterie Robert is rich in flavonoids that occur naturally in Croille cacao beans. Unlike other dark chocolates derived from cacao grown elsewhere, the Madagascar variety is low in bitterness and naturally sweet. Furthermore, the company is dedicated to fair trading and supports several small cacao farmers through micro-financing programmes. 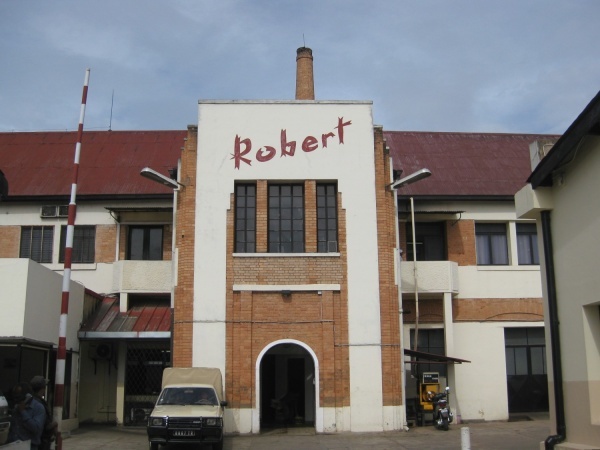 Today, Chocolaterie Robert's factory unit is a semi-industrial operation whose management, in an age of automated systems, still prefers to work with local people rather than machines. Hand-picked assortments of pralines and other chocolate creations are sold by weight at La Chocolatière boutiques. Pre-packaged pralines can also be found in some other well-stocked boutiques, such as Lisy Art Gallery in Antananarivo. Open Monday to Saturday from 10am to 7pm and Sunday from 10am to 2pm. Open Monday to Friday from 10am to 7pm and Sunday from 9am to noon. Open Monday to Friday from 8am to 5.30pm and Saturday from 8am to 12pm and 2pm to 5.30pm. Open prior to international flight departures. Open Monday to Friday from 8.30am to 12.15pm and 2.30pm to 6.30pm. Saturday from 8.45am to 12pm and 2.45pm to 5.30pm. Open Monday to Saturday 9:30am to 5.30pm and Sunday from 9am to 12pm. This page was last modified on 17 November 2016, at 04:46.